I am currently in love with these shoes, I never want to take them from my feet. I had been searching for a white platform sandal type shoe for awhile when I stumbled upon these white asos ones, every since then, they had the prime top spot on my lust list. There is so much to rave about these shoes, not only are they très aesthetically pleasing and practically dress up any outfit (with a 90s/grunge theme, oh of course) but they are SO comfortable and plus, they make me look a foot taller. While I'm on the topic of the lust list, the missguided ripped jeans are something I've adored for awhile. I think the presence of white in this outfit gives it a summery vibe, finally. I'm not one for wearing bright colours all over, a pop of neon through a satchel bag is enough for me, very rarely - if ever - would you see me donning a neon dominant look. I've taken to the minimalist look recently and I have to say I am loving it. 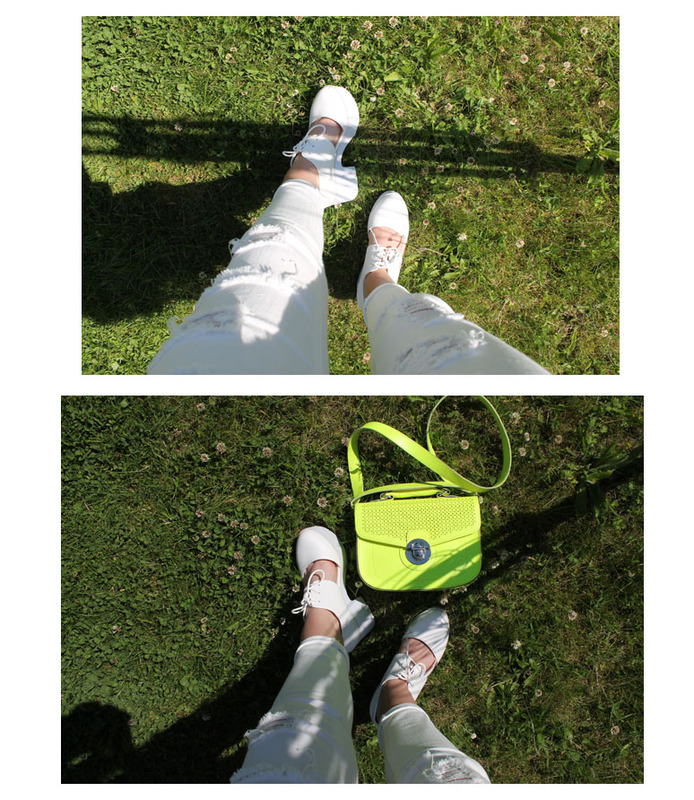 Those shoes are perfff and those high wiast white jeans flatter you so well, need them! This outfit is so pretty, i've recently bought similar jeans and they look so cool! your style is really impeccable . So edgy and style similar to my own taste. You go girl ! In my recent post I am also wearing some edgy distressed jeans , let me know what you think officially following you! Absolutely LOVE this outfit, your figure is lovely. Love your white ripped jeans! Are they cropped?